Galaxy Tab Samsung WiFi tablet now available for $350 | It-11 Audio / Tonegeek"
A WiFi-only version of the Galaxy Tab from Samsung is available, as expected, in the US for about $350. The tablet has the same processor (1 GHz Samsung Hummingbird) and 1024 x 600 pixel (7 inch) display as the 3G model (available since last year). The WiFi version has just 16GB of storage and a lower price tag. And you don’t have to contract for 3G service. 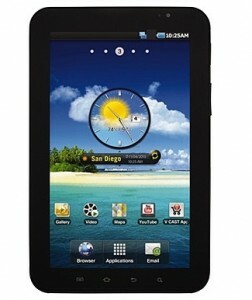 The tablet runs Google Android 2.2. This entry was posted in What's up, doc ? and tagged android, Galaxy, Samsung, tablet. Bookmark the permalink.